Appearing as the tenth coin in a series honoring the spouses of the former Presidents of the United States (and the second for 2009) is the 2009-W $10 Letitia Tyler First Spouse Gold Proof Coin. Making this coin even more unique than the fact that it is struck from 1/2 ounce of .9999 fine gold (like all of the other First Spouse Coins), the Letitia Tyler coin is the first to be associated with a President who had more than one spouse while in office. Letitia’s health was frail at best when John Tyler assumed the presidency and she passed away during his term. John then later re-married while still the chief executive of the nation. In such an instance, both spouses are to be honored on separate coins according to the authorizing legislation. The US Mint also struck uncirculated quality strikes of each of these coins and issued them at the same time. Struck to proof quality, each coin is composed of 1/2 ounce of .9999 fine 24-karat gold. 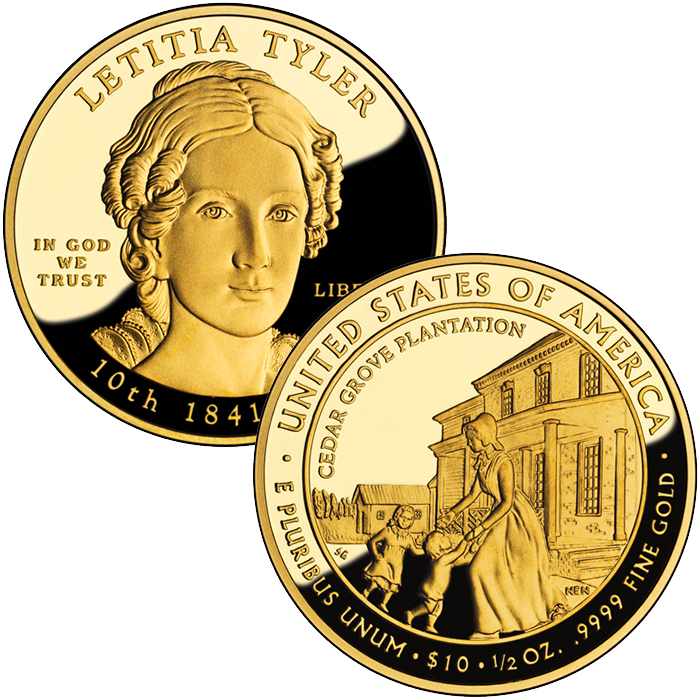 The US Mint released the Letitia Tyler coins on July 2, 2009. When first released, the US Mint charged $629 for the Letitia Tyler First Spouse Gold Proof Coin. However, the price fluctuated after that according to the Mint’s precious metal pricing matrix. A "W" mintmark on the design indicates that each coin was struck at the US Mint’s facility in West Point. 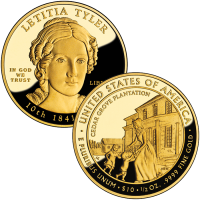 Phebe Hemphill designed the portrait of Letitia Tyler found on the obverse (heads side) of her coin. The reverse (tails side) was designed by Susan Gamble and sculpted by Norman E. Nemeth to show a younger Letitia playing with her two oldest children behind their Cedar Grove Plantation.